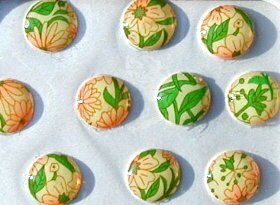 Note: Some quantites are limited & some Bindis may be substitued in orders with multiple Bindis. 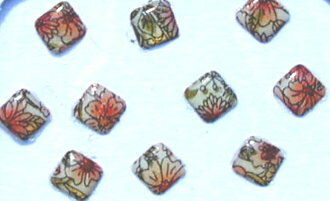 This is a 5" x 7" Sheet contains well over 50 Three Dimensional Bindis/Body Dots which are made of Velvet/Synthetic Stones. These Bindis also have an adhesive backing for ease of applying and the wide assortment of Bindi Styles, Colors, Sizes, and Shapes should satisfy everyone! 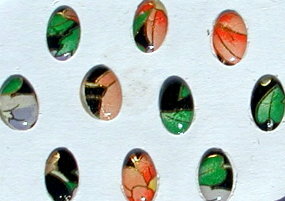 Save Around 50% with this Mix of 24 Bindi Packs Chosen From our Staff - the Bindis will be a combination of those seen below along with some others from odds and ends sets. 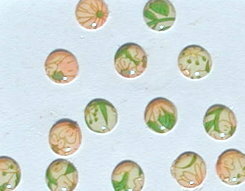 Save Around 40% with this Mix of 12 Bindi Packs Chosen From our Staff - the Bindis will be a combination of those seen below along with some others from odds and ends sets. 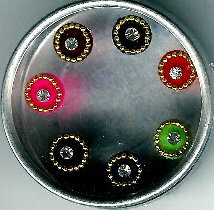 This is a Multi Colored 7 Pack of Round Shaped Bindis. The Bindis come in a Circular Case, are Three Dimensional w/ an Adhesive Backing and are Highlighted in Gold Colored Beads on Velvet. 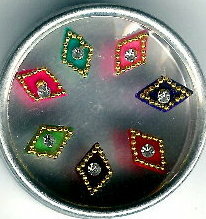 This is a Multi Colored 7 Pack of Diamond Shaped Bindis. The Bindis come in a Circular Case, are Three Dimensional w/ an Adhesive Backing and are Highlighted in Gold Colored Beads on Velvet. 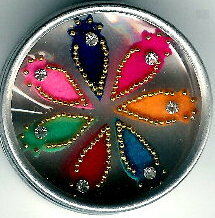 This is a Multi Colored 7 Pack of Oval Shaped Bindis. The Bindis come in a Circular Case, are Three Dimensional w/ an Adhesive Backing and are Highlighted in Gold Colored Beads on Velvet. 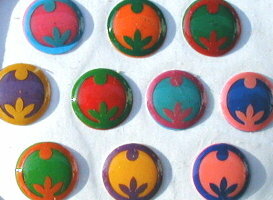 This is a Multi Colored 7 Pack of "J" Shaped Bindis. 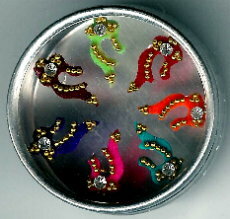 The Bindis come in a Circular Case, are Three Dimensional w/ an Adhesive Backing and are Highlighted in Gold Colored Beads on Velvet.